In December 2013, the French army intervened in Bangui, capital of the Central African Republic (CAR). The former president Michel Djotodia, who had overthrown François Bozizé in March last year, has since stepped down from the presidency, under the pressure of the “international community” but particularly from Paris. Catherine Samba-Panza has replaced him and was sworn in last month in the presence of the French foreign minister, Laurent Fabius—a clear indication of Paris’ strong support. Just over a year ago, France also intervened militarily in Mali, to regain the northern part of the country which had fallen into the grip of al-Qaeda in the Islamic Maghreb (AQIM) and the Movement for Unity and Jihad in West Africa (MUJAO). Françafrique, the special French way of doing business in Africa to preserve its economic interests, is too often believed to be over. 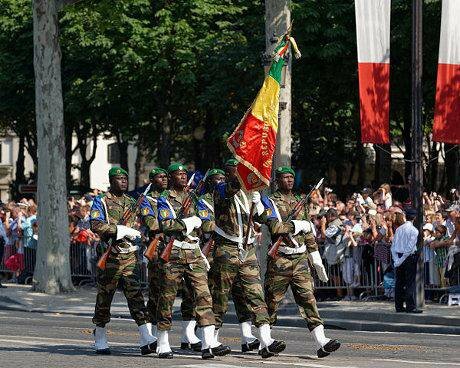 French military activism in Mali, the CAR and—via NATO—Libya, as well as previously Côte d’Ivoire (Operation Licorne in 2002), clearly indicates Paris’ continuing paternalism towards the continent, especially its former colonies. French decisions concerning large parts of Francophone Africa are still taken in a political cell in the president’s Elysée Palace, rather than the Ministry of Foreign Affairs at the Quai d’Orsay. A subtlety has been added, though: while in Côte d’Ivoire, for example, the French army intervened alone and without any international endorsement, Paris now takes advantage of its permanent seat at the United Nations Security Council and is careful to obtain a mandate from the UN to engage its troops. Faced with the instability of several regions in Africa, from Djibouti to Senegal, Paris is reviewing with a number of African presidents its military positioning on the continent, to facilitate rapid deployments. In northern Chad for instance, 350 kilometres from the Libyan frontier, the French army is reorganising its security disposition, to enable it to intervene across the 5,000km-long Sahel belt—the crossroads of numerous traffics and contrabands, as well as haven for non-state military groups. Paris is also reinforcing its military co-operation with Niger. In the capital, Niamey, the French minister of defence, Jean-Yves Le Drian—who recently embarked on a political shuttle in central Africa to rally support—has announced that the French army intends to remain for a very long time and that an extension of its military base there (Niau Sahel) has been negotiated. France can undoubtedly rely on Chad and Niger as key political and military players, alongside French troops. Meanwhile, in northern Mali, sporadic jihadist attacks and skirmishes recurred in December with French soldiers involved in Operation Hydra—an unfortunate choice of name, given that in Greek mythology the Hydra of Lerna was a monster which grew two heads for every one cut off. The leadership of the UN Multidimensional Integrated Stabilisation Mission in Mali (MINUSMA) complains of inadequate resources and delayed salary payments. More generally, insecurity prevails in the vast Sahel, due to the diffusion of armed groups who have found refuge in the chaos of neighbouring Libya. These jihadists are highly mobile and adapt their strategies to foil surveillance, digging tunnels to enable them to cross already porous borders with their light weaponry. The security of African states depends on reinforced inter-state co-operation. There has been genuine progress through centres of excellence, including well-designed training programmes and trainers who meet high standards under the auspices of the African Peace Support Trainers Association (APSTA). Such tools put in place by Africans ought to be the base of any regional security co-operation in Africa—in north-west Africa, for instance, there are the Common Operational Joint Chiefs of Staff Committee (CEMOC) and the African Centre for Studies and Research on Terrorism (ACSRT), albeit imperfect, inaugurated in 2010 and 2004 respectively. Co-operation among the contiguous countries—including Mauritania, Niger, Mali and Algeria—could be enlarged and extended to include neighbours and members of ECOWAS, such as Nigeria, which faces growing Islamist attacks from Boko Haram and its offshoot, Ansaru. The African Union (AU) can provide normative support, for example through its agreement on non-payment of ransom to kidnap gangs. The latter have not only enriched themselves through lucrative hostage-taking but also financed lethal actions in return with money paid by many states. It is urgent that the AU operationalise the envisaged African Standby Force (ASF) and the African Capacity for Immediate Response to Crises (ACIRC), so that adequate solutions to continental problems can be found endogenously. The ACIRC will have a strong mandate to intervene in crises at short notice. Equally important, a synergy among African police forces could reinforce security across the continent. Concretisation of the much needed Afripol—which should work in close collaboration with Interpol—will be on the agenda during the 23rd Assembly of Heads of State of the AU, in Equatorial Guinea this July. Last but not least, funding is crucial and the AU must find innovative ways to fund its military and peace activities. As the South African president, Jacob Zuma, put it during the 50th anniversary of the AU (formerly the Organisation of African Unity), “a free and self-sustaining Africa will be a pipe dream if we remain beholden to external sources”. What the French military interventions—and NATO’s in Libya—demonstrated is that the AU needs to be at the heart of collaboration. Structured partnership with the European Union (EU) should replace ad hoc operations such as those pursued by the French in Mali and the CAR. Fighting asymmetrical forces such as AQIM and MUJAO or al-Shabab in east Africa with conventional arms leads in any case to glorious failure. At best force offers only a temporary solution, postponing real and lasting solutions to the numerous African problems, whose socio-political and economic roots run deep. The causes of the Sahelo-Malian crisis, as those in Somalia and Western Sahara—or, next, the Casamance area of Senegal with its separatist movement—are apparent and often have been for decades. Addressing insecurity means urgently tackling economic underdevelopment, drought, uncertain food supplies, social and political injustice, corruption and weak governmental institutions—all factors fostering violence. Trade in drugs (including tobacco) and small arms and other illegal commerce has provided an economic underpinning. Reinforcing the institutions of African states, in collaboration with civil society networks, is essential if these threats are to be attenuated. Africans cannot however achieve this alone. A solid partnership with the Europeans, the Americans and other countries and regions of the globe is needed to address problems which indirectly affect the entire world. “Africa is our future” was the title of a recent report drawn up by two members of the French Senate. No doubt—but such Afro-optimism must not be at the expense of the interests of those immediately concerned. In April, the EU-AU summit will be held in Brussels. This should be the occasion for Africans to reiterate their profound attachment to a solid geostrategic partnership with the Europeans. This must however remain under African ownership, taking into account the AU’s position and the prime interests of its member states. Any alternative is very likely to fail.